Order online at bottom of page. Free shipping on all orders over $50 to the contiguous 48 with quantity discounts starting at $100. Our customers in Alaska or Hawaii should use our older A&H Pages link. Customers close to Louisiana will probably save money by using our older pages. Use the Near Louisiana link to check it out. 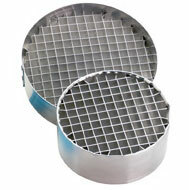 Each BakePacker Accessory is a ring of aluminum containing interlocking grids of sheet aluminum forming small (about 1/2-inch square) vertical divisions. The appearance is much like the cardboard used to separate Christmas tree ornaments in their boxes. The BakePacker is placed in any pot (the closer the fit to the diameter the more efficient) and about one inch of water is poured into the pot. The Ultralight BakePacker fits in a 6" pot, and the Standard BakePacker fits in a 7.5" pot. Your food (entrees, breads, muffins, even soups and desserts) are prepared in the one gallon "Glad plastic food storage bags" (Not zip types) and placed on the BakePacker. You just add your food to a bag, add the water (Note: reduce the water recommendations by 25%. They expect a lot of evaporation to occur while cooking. ), blend and put it on the grid. The top of the bag is then folded down to keep most of the moisture in, the pot is covered, and the water in the pot is brought to a boil. A rapid boil is not necessary, but make sure steam continuously escapes from under the lid. The grid holds the water in columns, which act very much as heat pipes do, intensifying heat transfer, and they rapidly cook your food. Breads, depending on the dough type (density), are ready in 15 to 25 minutes boiling time. Entrees are ready more quickly, even when uncooked items (dry or fresh) are in the bag. No accessories are required for BakePacker Accessory use other than a supply of bags. They cost about $3.00 for 75 at any grocery store, and please don't use any zip lock bags or food storage bags other than Glad, the other plastics can't handle the heat. For other foods with very high fat content (some meat stews for example) or lots of sugar (soft brownies for example) use Reynolds Oven Roasting bags. They are larger and more expensive, but can be cleaned and reused and will withstand the heat concentrated by the fat or sugar. Never let the water in the pot get too low or run dry! The pot itself may be damaged and the Glad bag will melt into the BakePacker grid. That is a genuine mess to clean up. If you must peek at your food, do not remove it from the stove (keep it boiling), open the lid away from yourself (because of the steam), and test the dough for resilience or by carefully unfolding the bag and looking at the center of the dough. Some dehydrated items (most noticeably potato shreds and slices) can easily puncture the Glad bag. Use care in adding water and blending in the bags and carry some extra Glad bags in your pack. Price Matching: LDP Camping Foods will match any other dealer's sale or special price at any time. Just let us know about the other guy's bottom line price in the note section of our checkout, and you'll get the same when we process your order here. Call 800-826-5767 if you have any questions. If you don't already own a pot that is the right size for the BakePacker, or if your pot is getting a bit old and shabby, please consider the two pots below. They are made of lightweight aluminum, non-stick Teflon coated on the inside, and have a beautiful enamel finish on the outside. To save money and weight, there are no handles on the pots, so you will need a "Jaws" pot lifter to handle the hot pot. This page was last modified on October 4, 2018.